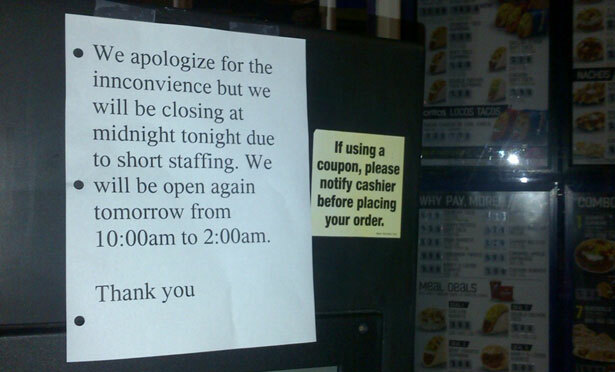 Seattle is the seventh city in eight weeks where fast food workers have gone on strike. Beginning at 10:30 pm Pacific Time Wednesday, workers at dozens of Seattle fast food locations began striking, launching the nation’s seventh work stoppage by fast food employees in eight weeks. Organizers expect workers from chains including McDonald’s, Burger King, Taco Bell, Subway, Arby’s, Chipotle, Qdoba and Jack in the Box to participate in the walkout, which will last roughly twenty-four hours. “I’m sick of seeing my co-workers and me essentially get pushed and pushed and barely be able to eat,” Taco Bell employee Caroline Durocher told The Nation Wednesday. “And I think it’s time that we pushed them back.” Durocher said she’s hopeful that both co-workers on her late night shift will walk off the job with her. Like recent fast food strikers in New York, Chicago, Milwaukee, St. Louis and Detroit, the Seattle strikers are holding a one-day walkout to demand a raise to $15 per hour and the right to form a union without intimidation. Like those cities’ strikes, Seattle’s is supported by a coalition of labor and community groups; in each case, the Service Employees International Union has been involved in supporting the organizing efforts. The Seattle campaign, Good Jobs Seattle, is backed by groups including Working Washington, the Washington Community Action Network and OneAmerica. The Seattle strike comes two weeks after New York’s fast food workers campaign released a report alleging rampant wage theft in the industry, and hours after the Congressional Progressive Caucus announced plans for a nationwide tour focused on low wages and economic inequality. It also follows a day-long strike last week in Washington, DC, staged by federally-contracted workers—including fast food employees at federal buildings—demanding that President Obama take executive action to improve their working conditions. Asked Wednesday about the previous strikes, a Burger King spokesperson e-mailed, “For decades, Burger King restaurants have provided an entry point into the workforce for millions of Americans, including many of the system’s franchisees who began their careers working at local Burger King restaurants.” Noting that nearly all of its restaurants are owned and operated by franchisees, the company added, “Burger King restaurants offer compensation and benefits that are consistent with the QSR [Quick-Service Restaurant] industry. Burger King Corp. does not make employment-related decisions for our franchisees.” Taco Bell and McDonald’s did not respond to requests for comment Wednesday afternoon. Rather than training all their firepower on a single company, the fast food campaigns have chosen to target all the industry players at once. That strategy risks diluting resources and reducing the pressure on an individual CEO, but offers the chance to draw greater public engagement and perhaps to peel off whichever chain is most willing to make a deal. While fast food workers are often legally employed by franchisees, any realistic scenario for winning union recognition or a major pay hike would require convincing national CEOs that concessions would be less painful than further conflict. That remains a tall order. Update (11:45 am EST Thursday): According to the Good Jobs Seattle campaign, workers are now on strike at dozens of locations, and have forced shutdowns at three stores: A Taco Bell and a Burger King on 15th Avenue, and a Subway on Broadway (photo above). Following a string of morning strike rallies, strikers plan to converge at 4:30 pm Pacific Time for a march from Seattle’s Denny Park to a series of fast food stores. On Wednesday, a dozen undocumented immigrants and allies were arrested outside an Obama fundraiser for protesting the administration’s record deportations. Read Aura Bogado’s report.